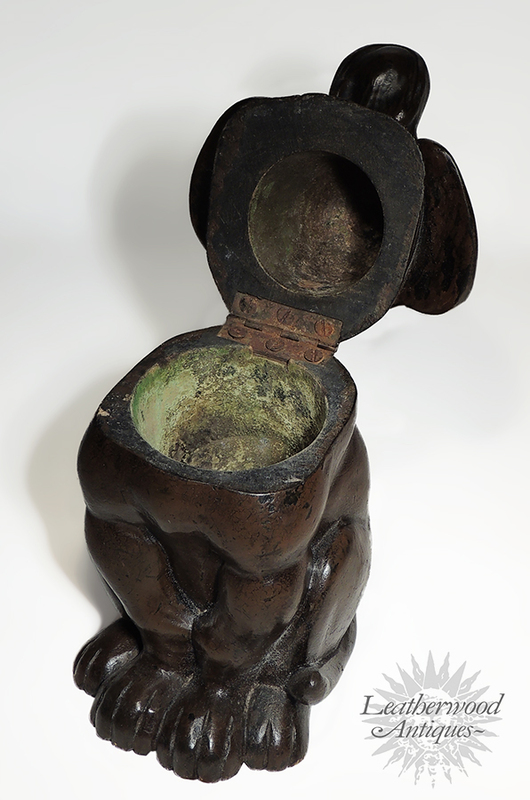 To view more Black Forest objects, select Inkwells (Figural) from the menu! 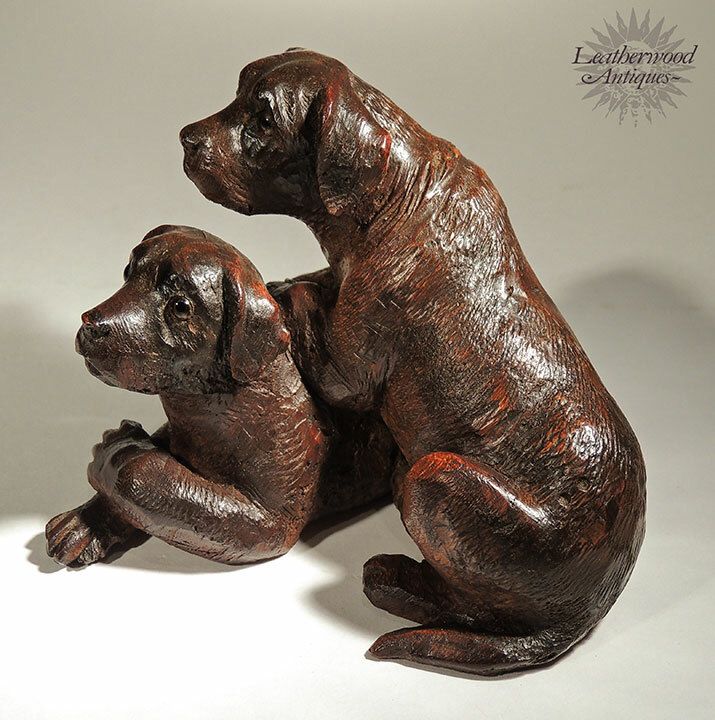 Thank you for visiting Leatherwood Antiques. 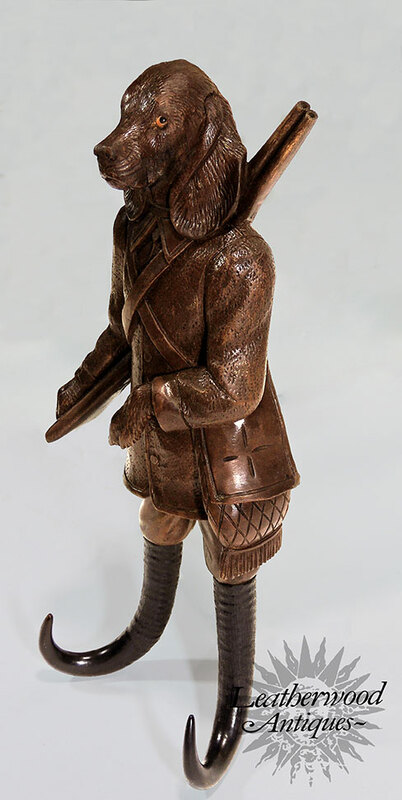 Owls, Bears, Rabbits, Foxes, Dogs, Cats, Monkeys, Boars, and Elf's. Shown is a small selection from our inventory. 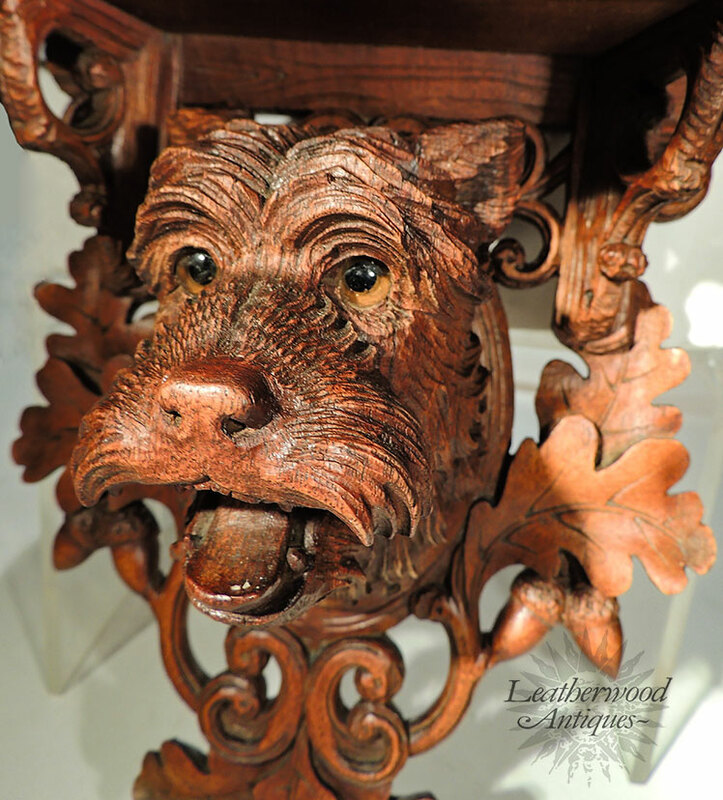 An oversized dog head musical box (probably used for tobacco or jewelry). Swiss, Late 19th Century. 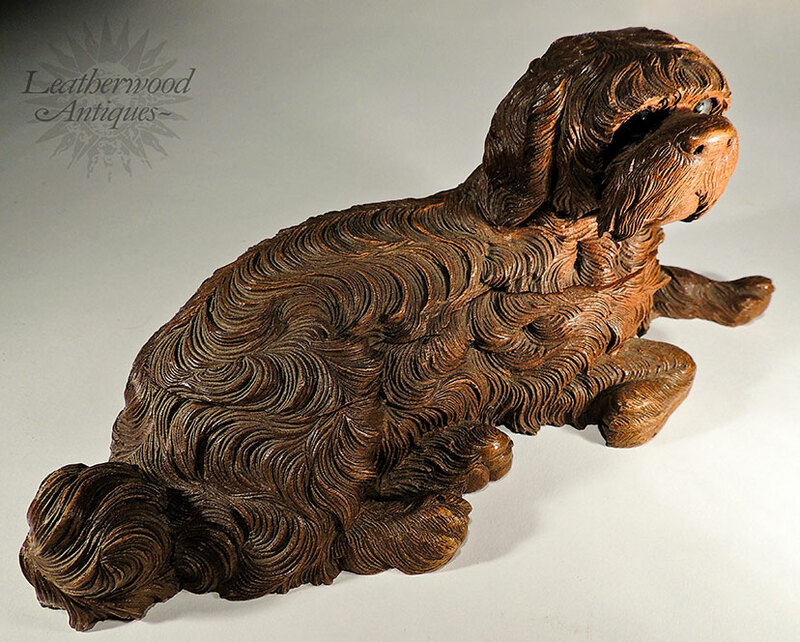 A sculpture of a shaggy dog and a mouse with a hollow weaved basket -- all finely carved. Swiss c. 1880. Superb dog family group with a mother dog watching her two playful pups on a grassy base. Swiss, Late 19th Century. 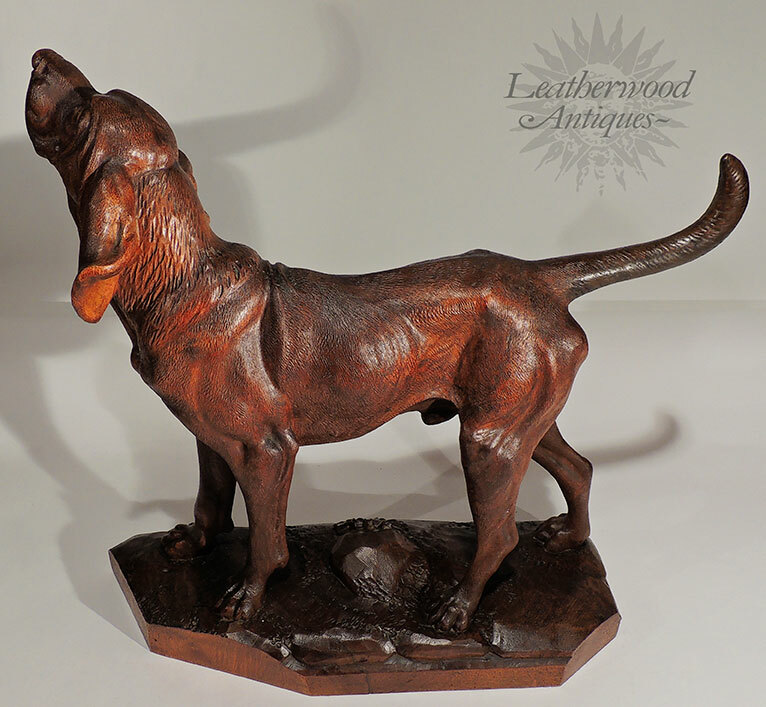 Brilliantly carved dog in that "pointing" pose which seems to say, "Come see what I've found ". He has shaggy ears and coat and very sweet facial expression that is very huggable. 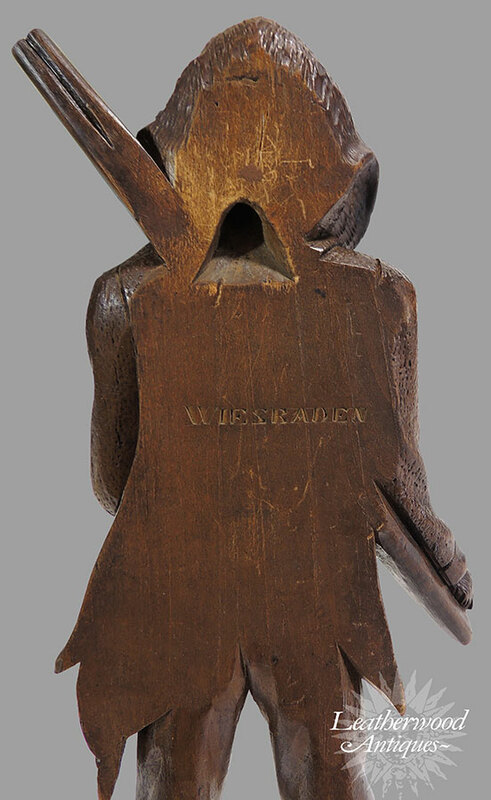 Swiss, Late 19th Century. Mother Dog with a puppyresting on her back.. Swiss c. 1910. 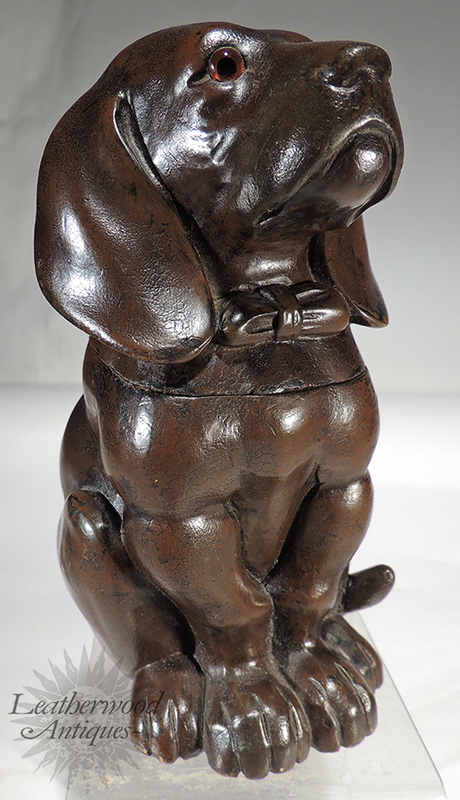 Rare miniature Black Forest carving of a mother dog with her three puppies – the smallest we ever had. Swiss c. 1890. 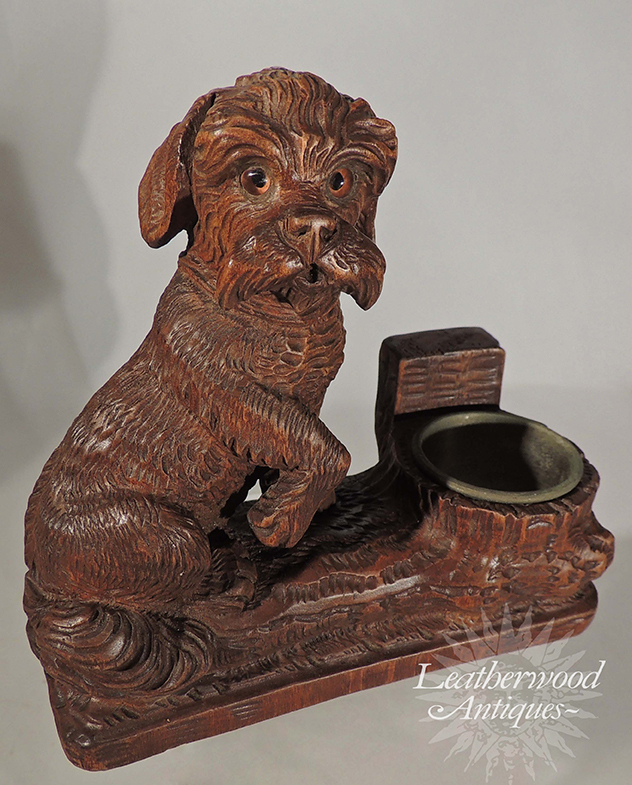 Watch holder in the form of a carved dog raising his front paw. 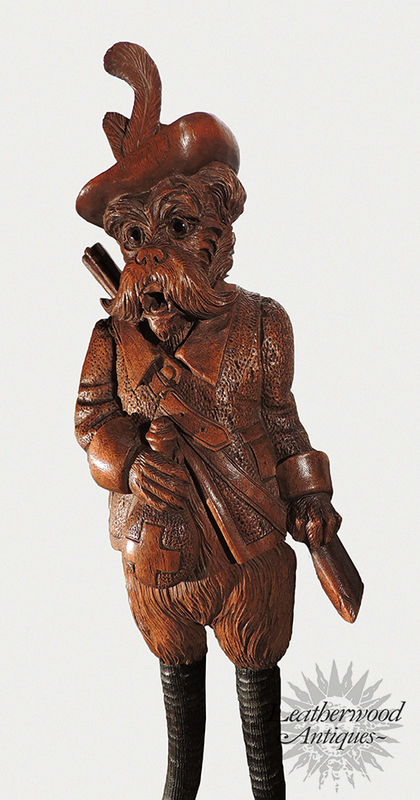 Swiss, Late 19th Century. 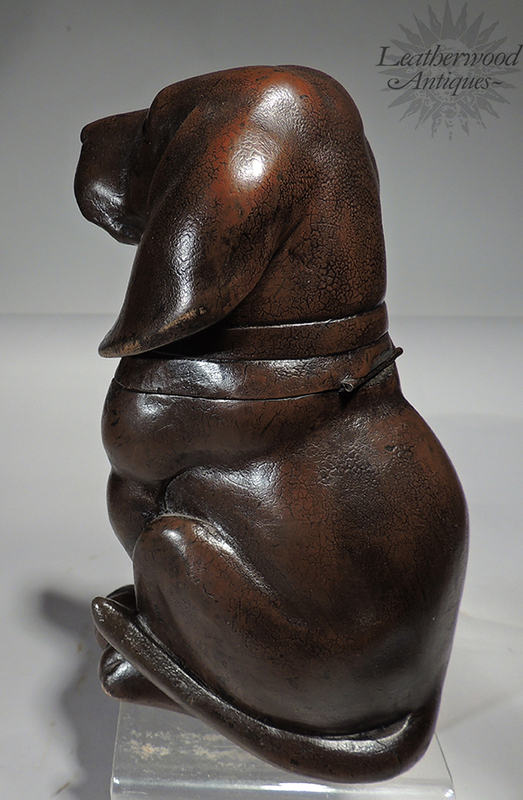 Finely carved dog holding a hollowed treen barrel; possibly for snuff or liquor. Swiss, Late 19th Century. 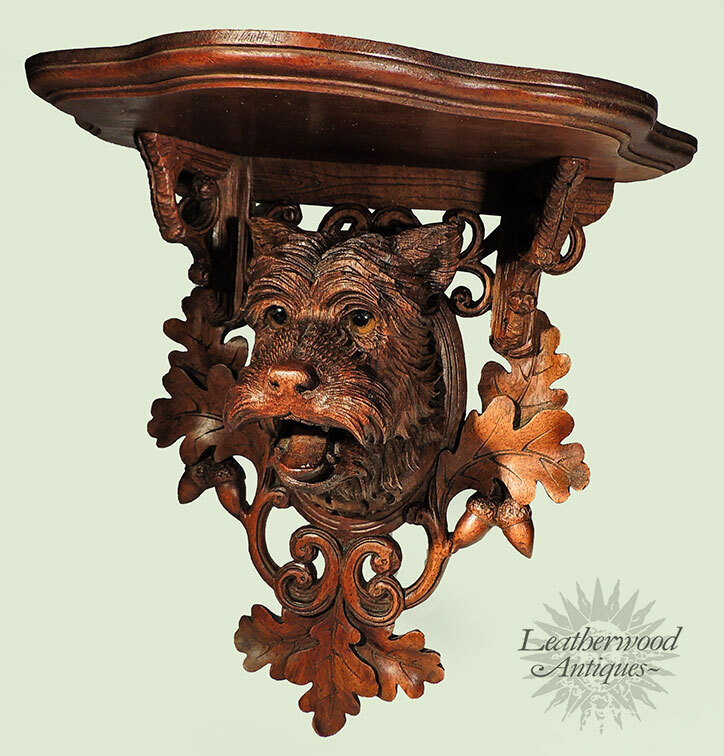 Shaggy blue-eyed dog double inkwell (missing glass inserts) with exceptionally carved stylized fur. Swiss, Late 19th Century. Whimsical dog emptying a wheel barrel. 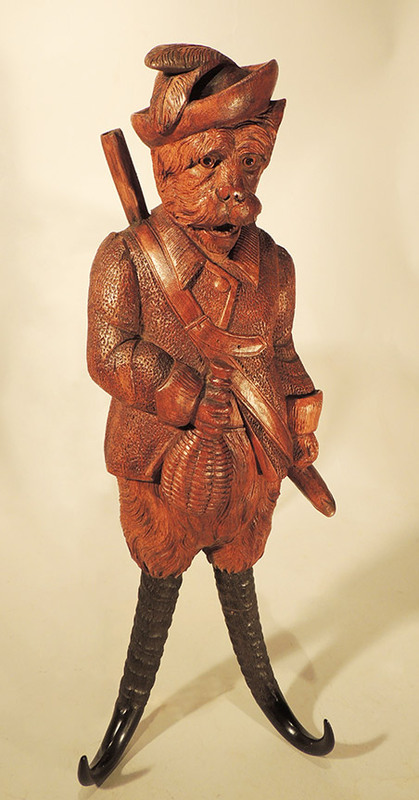 Swiss, Late 19th Century. 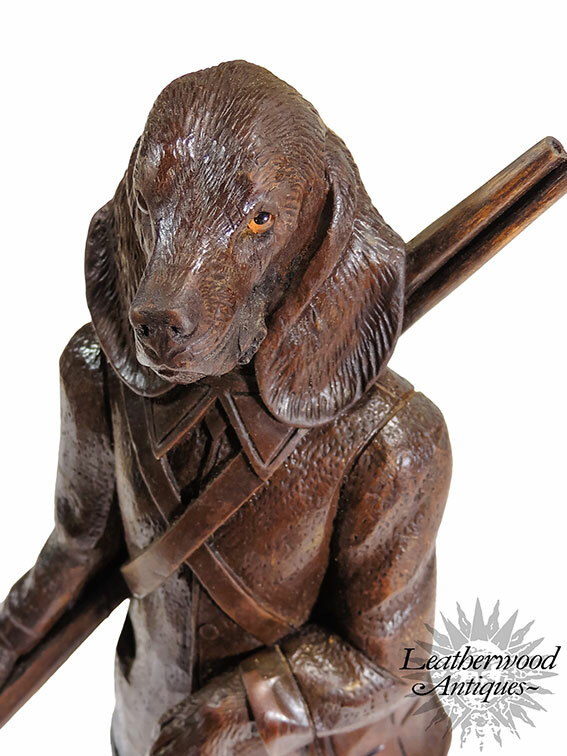 Black Forest Dog inkwell laying on a "pen rest" base. Swiss, Late 19th Century. 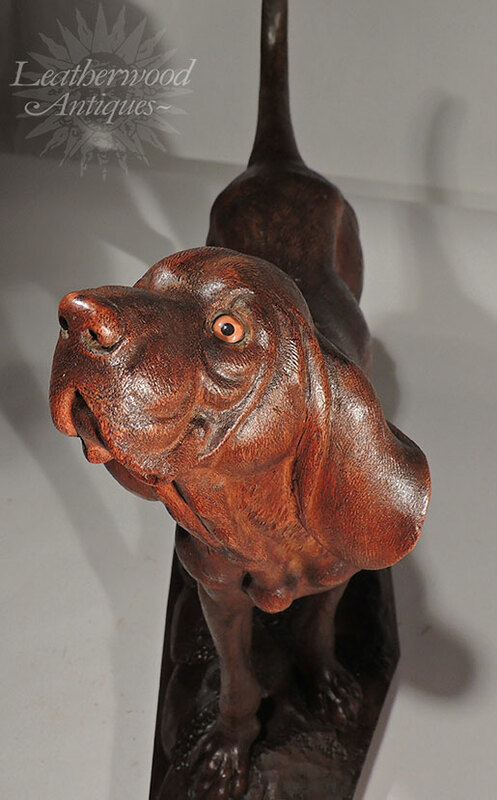 Stylish signed (P. Belys) ART DECO carved Dog Bookends. French c. 1900. 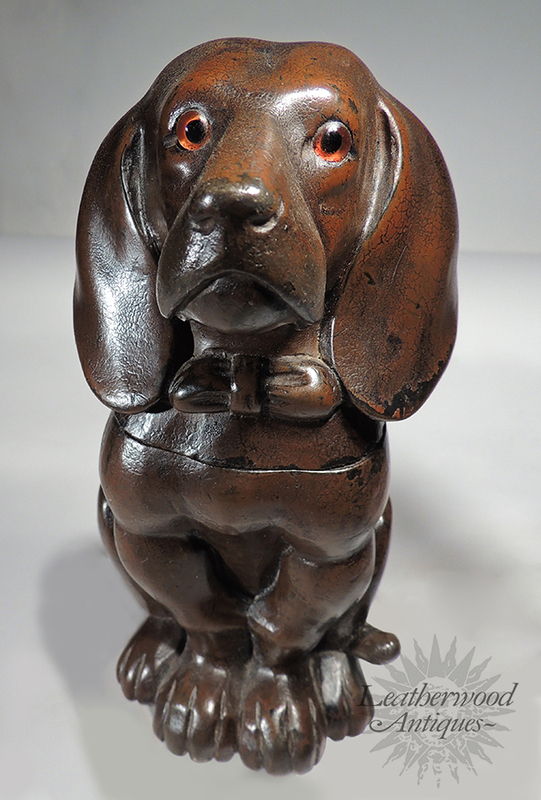 Black Forest dog inkwell with pen holder. Swiss c. 1880. Small Black Forest Dog skier ready for the slopes. Swiss, Late 19gh Century. Small Black Forest Dog skierready for the downhill run. Swiss, Late 19th Century. 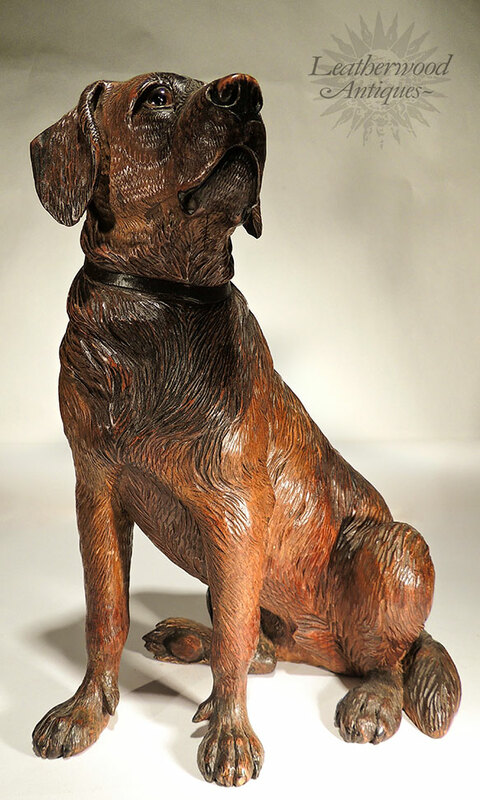 Fine walnut carving of a sitting up sweet dog. Swiss c. 1900. 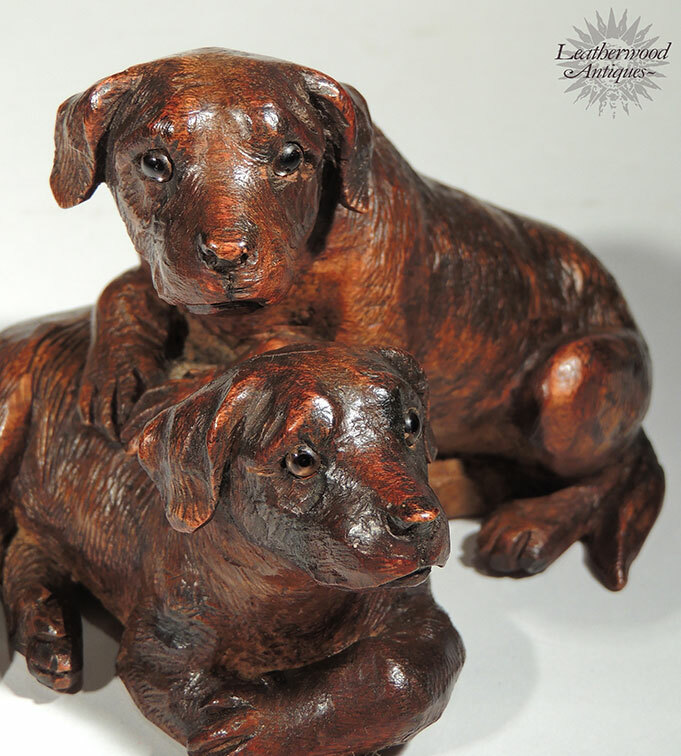 Carved Black Forest mother dog with two rumbustious pups. Swiss c. 1900. 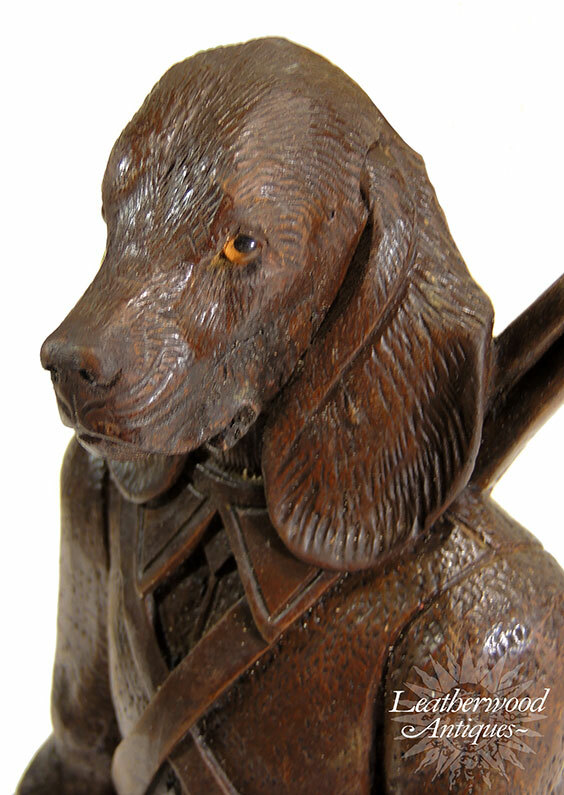 Dress hunter dog whip holder with great expression. Swiss, Late 19th Century. 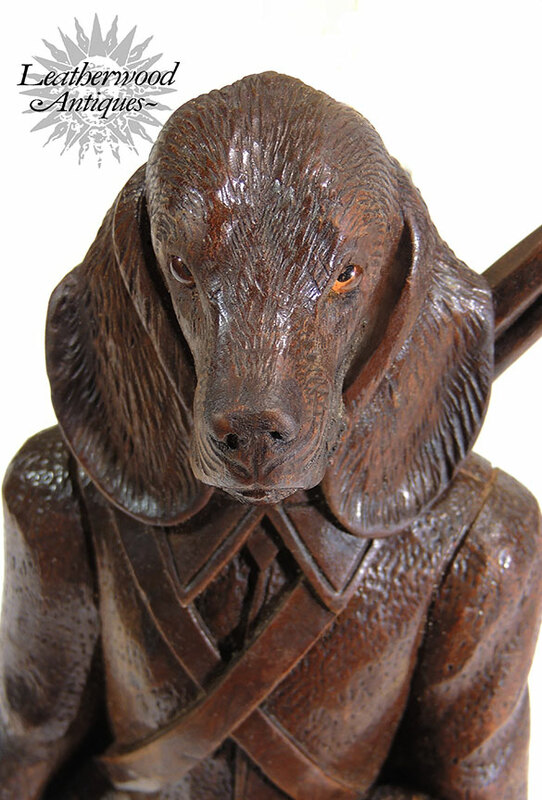 Long eared hunter dog whip holder with gun & satchel from Wiesbaden. German c. 1900. 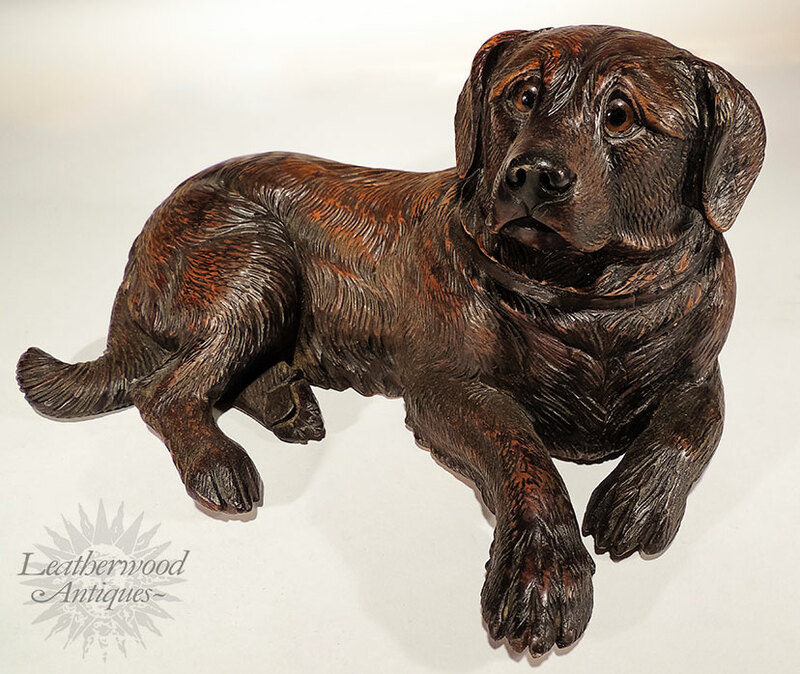 Swiss superbly carved recumbent dog with sweet expression. Swiss c. 1900. 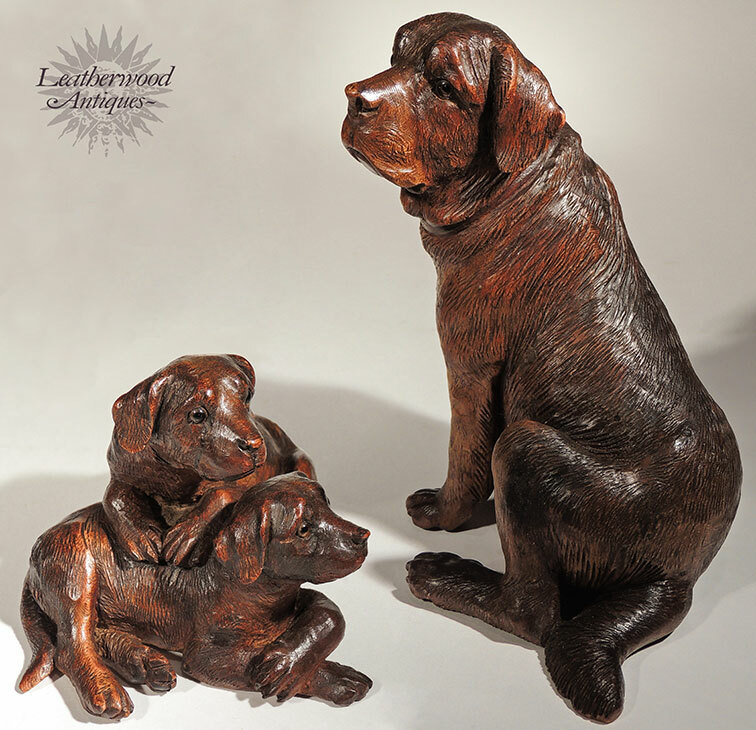 Size: 4 1/2" H x 9 1/2" L x 7"
Finely carved mother dog & two pups. Swiss, Late 19th Century. 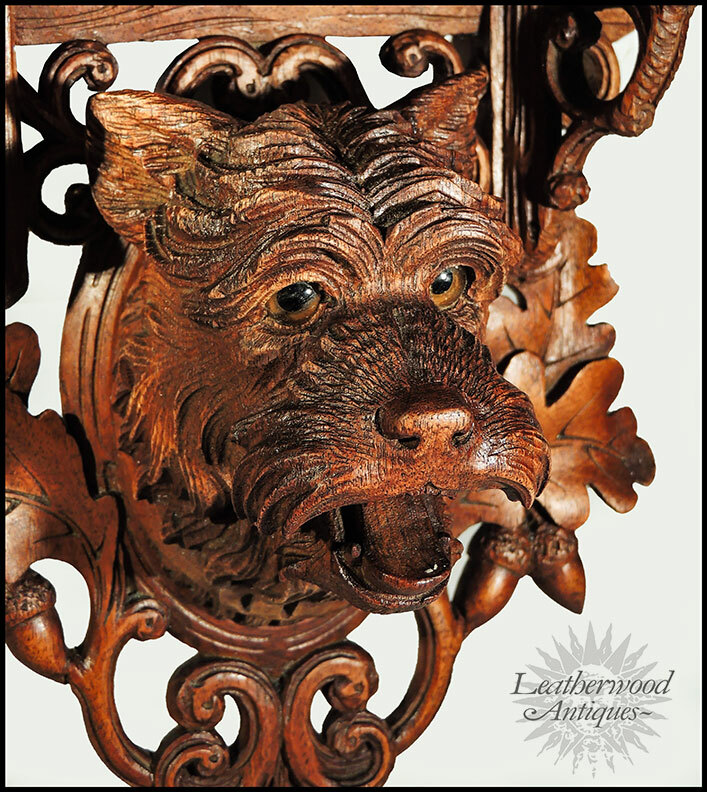 Carved dog head wall piece. Swiss c. 1860. 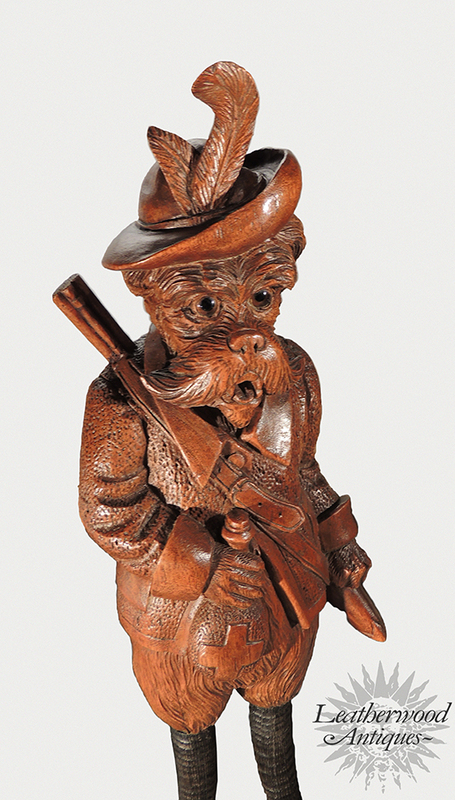 Heavy mustached dog hunter whip holder with a feathered hat & gun. Swiss c. 1880. 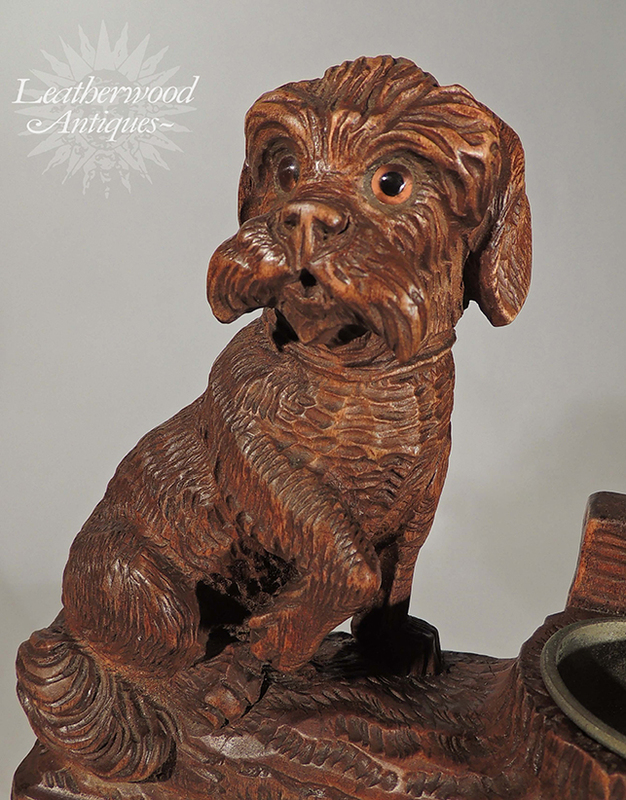 Sweet small Dog (possible Schnauzer) match stand. Swiss, Late 19th Century. 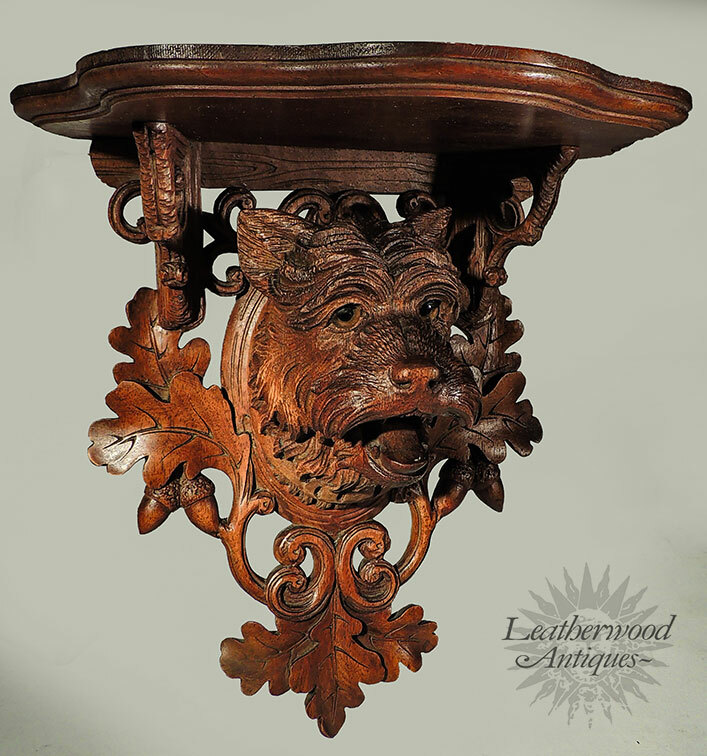 Black Forest dog head on branch with oak leaves rack. Swiss c. 1900. 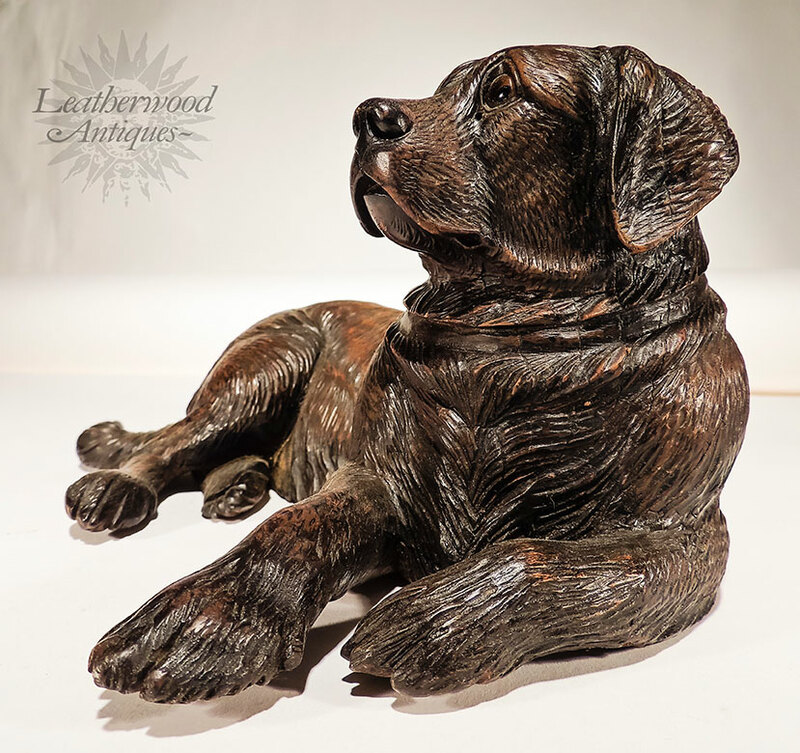 Finely carved Black Forest recumbent dog with head cocked resting on leg and with one ear flopped. Swiss c. 1900. 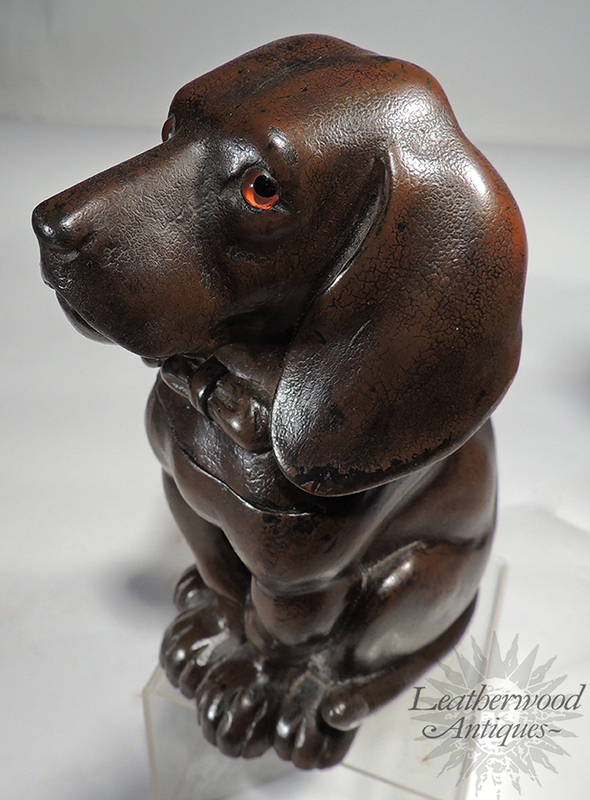 Puppy dog inkwell with tray & glass eyes with a loveable facial expression. Swiss, Late 19th Century. 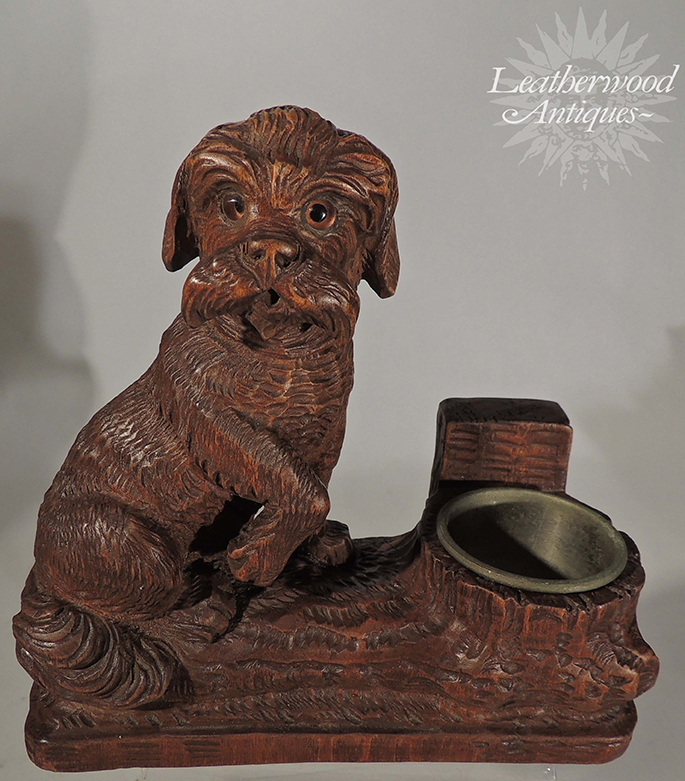 Great face on this hound / dog inkwell with paws on tray. Swiss, Late 19th Century. 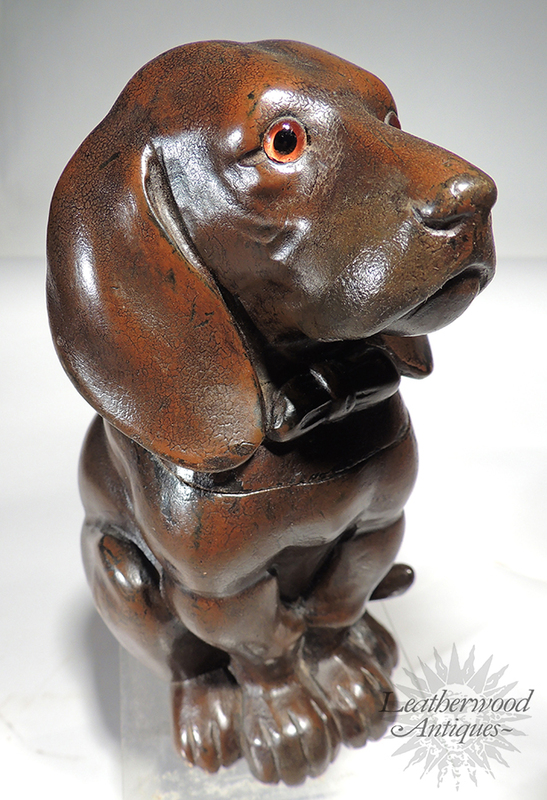 Size: 7" x 4 1/2" x 4 1/8"
Carved and seated cute BF Dog tobacco box possibly dachshund. Late 19th Century. 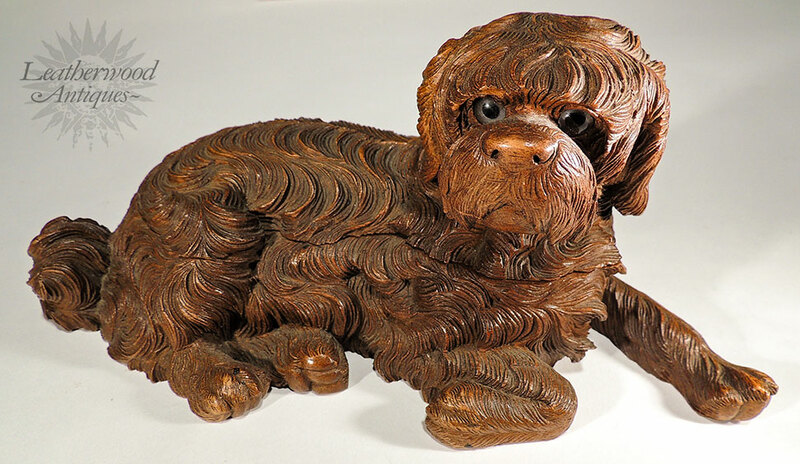 Finely carved cute shaggy dog holding a serving tray as a small "dumb waiter". French c. 1880. 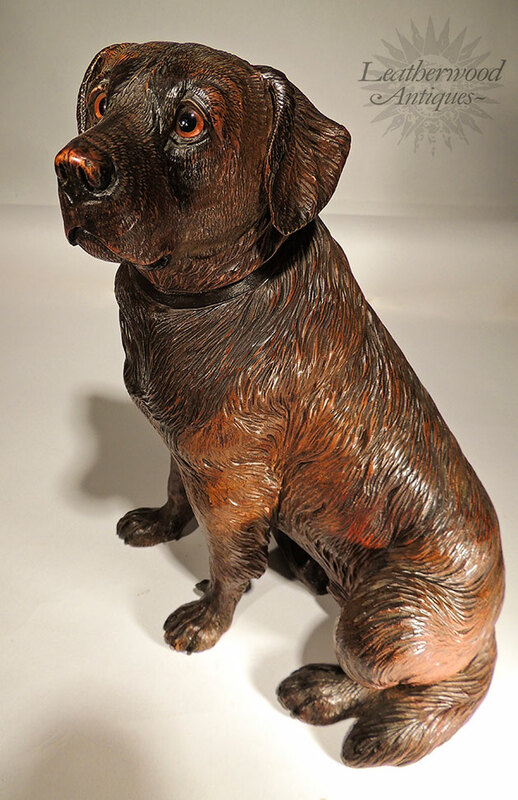 Great Expression on this fine carved walnut Swiss Dog. c. 1900. 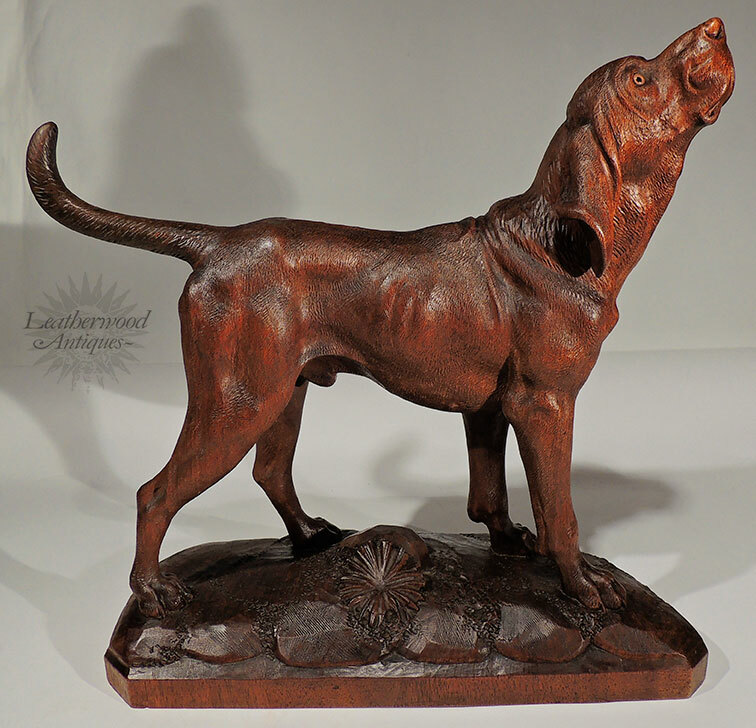 Fine carving of a BF dog catching a scent. Swiss, Late 19th Century. 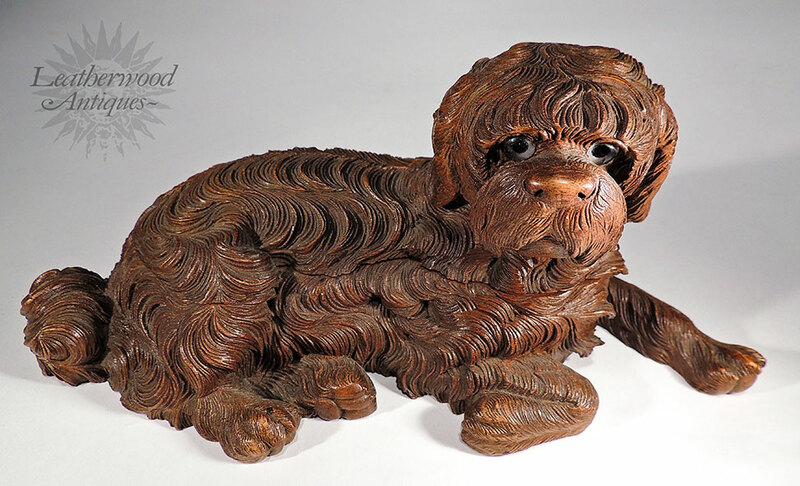 Finely carved Black Forest dog bracket / shelf. Swiss, Late 19th Century.